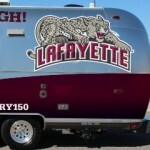 The College is planning events in Easton and at other locations outside New York City to allow Leopards near and far to share the camaraderie and experience the pride and excitement of being part of the Lafayette community during this historic occasion. Download the event flyer and fill out the mail-in registration form. 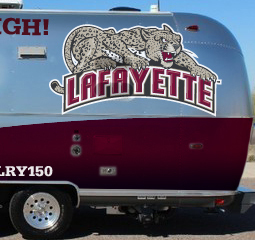 Michael ’82 and Jenny Marshall Weisburger ’82 will travel across the United States in an Airstream trailer to engage and energize the Lafayette community. Social media, photos, videos, and alumni events will document this trip in real time with stops planned in the following cities: Los Angeles, Denver, Houston, Atlanta, Raleigh, Pittsburgh, Philadelphia, and Easton. 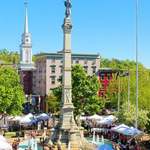 The trip will culminate with an appearance at the Downtown Easton Community Kickoff Event. For more information and registration, visit the Road Trip to Rivalry150 webpage. Competition doesn’t just take place on the field. The Lafayette-Lehigh Giving Challenge is a friendly competition to engage all alumni, students, parents, and friends by seeing which school can rally the greatest number of donors over a ten-day span. The challenge kicks off Nov. 12 and continues through the end of halftime of the big game. Gifts can be made by texting PARD to 20222, check, credit card, online, or by phone, (610) 330-5034. Saturday, Nov. 15, 11:00 a.m.
Lafayette will team up with the Easton community for a celebratory event thanking the city for supporting the College and its many athletic teams and student groups. All students, faculty, staff, and families are welcome to join the festivities. Participants will include President Alison Byerly, Vice-Mayor Roger Ruggles, Coach Frank Tavani, football team captains, Lafayette Pep Band, the Lafayette Leopard, and more. The event will take place during the Farmers’ Market. Stop by for tailgate munchies (hot dogs, pretzels, popcorn), meet the Leopard, jump and jive with the Pep Band, and enter for a chance to win many raffle* prizes! 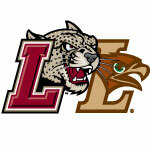 Enjoy the big game with Lafayette and Lehigh alumni and parents in your region. Free giveaways for all attendees. These events are planned locally by alumni volunteers from both schools and coordinated by the Office of Alumni Relations. To learn more, visit the telecast party website.